What a year so far! One thing’s for sure, it couldn’t have been any busier! The Shootout for me so far has been a success, I’ve lead it once or twice, and always been in the top 3. Danny narrowly missed out being in the top 6 but isn’t too bothered about that! He has plenty of time on his side. Young Frankie is still at the top of the points followed closely by Faye Smith. JJ is 33 points ahead and has 3 meetings remaining so will have to work hard to keep his silver stripes. His tarmac form has been phenomenal this year. His shale form has been good, but he needs to work on his confidence a little on this particular surface. Still, with just two full seasons under his belt he has achieved so much and I’m sure will continue to go from strength to strength. Phoebe is loving the V8s. We love watching her race. She’s a good ‘all rounder’ on both surfaces although she prefers to race on shale. Until recently she managed to remain red top for most of the year which is a great achievement in its own right, especially for her first season. Her gold top race recently at Birmingham brought a bit of disappointment. As I watched her in practice I noticed her car didn’t sound quite right. After a good inspection I discovered that valve spring had broken. We tried everywhere to get one but to no avail. So disappointing, but she could still manage to race. She started on 8th row inside, didn’t get the best of starts, but when she got going drove mint! She finished 15th so not a fantastic result, but she finished and I couldn’t have been prouder by her effort. Later on that same evening, during her heat the engine blew! Phoebe’s 2012 racing has now finished but we look forward to her season next year. Danny has had a mixture of success and bad luck recently. He seems to have suffered a run of bad luck in the heats but has come through particularly well in consolations and Grand Nationals. 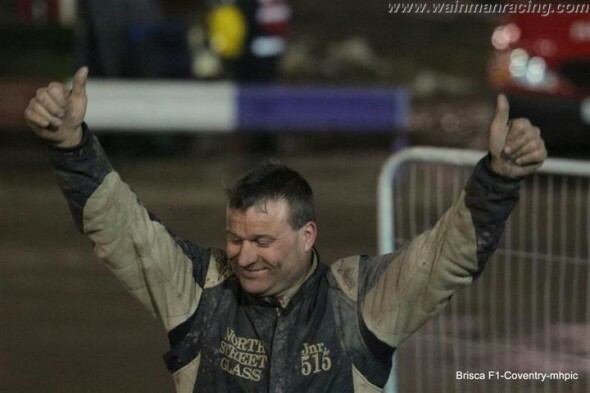 His tarmac form as well as his shale has been up and down mainly due to bad luck, but when luck’s been on his side he’s been faultless and has picked up some good results and wins! 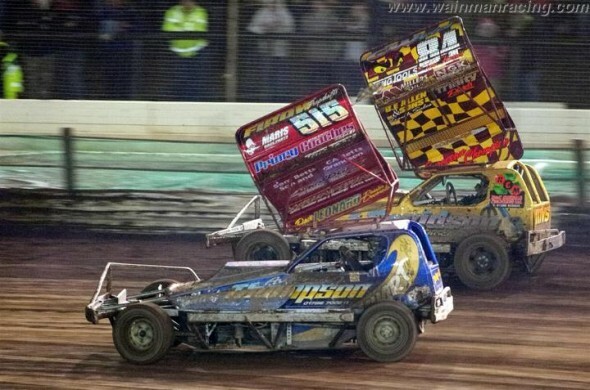 On top of the racing we managed to hold an ‘Open Day’ at the Wainman HQ. We were amazed by the amount of people who turned up. We think approx 600 race fans attended. Parking was turning into a bit of a problem, but somehow we managed. It was a terrific day. Sam, Alison and Jo managed the food trailer and sold out! Well done girls for doing a great job! The following day I celebrated my 25th year of F1 racing. With the Help of Steve and Jackie Rees we held the meeting at Belle Vue. The weather wasn’t great but I thoroughly enjoyed the day itself. It was brilliant to see the “Class of ‘87” race. The Hodgson Brothers pleased the crowd by showing all they haven’t lost their touch! 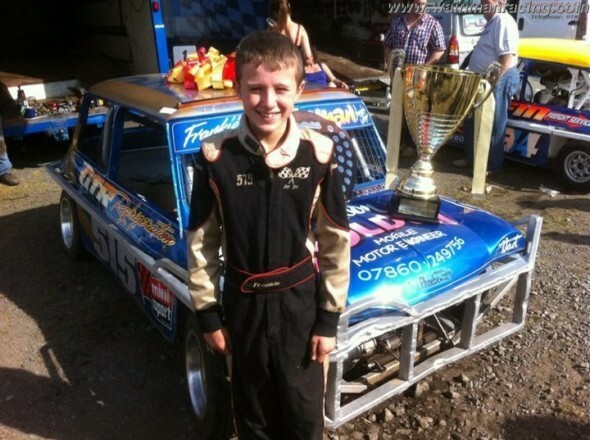 Also Ray Witts won his race with a faultless drive! Thank you to all drivers who made the effort to attend and to a lot of fans for turning up to support my 25 years in the sport! 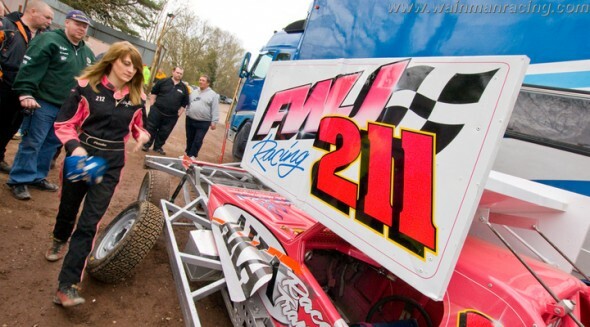 On Saturday gone I managed to win the ‘World of Shale’ at Coventry. My start was a bit dire! Throttle stuck on and I drove myself straight into the fence. I managed to re-join the race and worked my way back up to the front. The car felt good and quick and I was delighted to cross the line in first place. The rest of the meeting was a mix, but still another podium finish with third in the Final. The National was yet another good race. Danny was in the lead so I drove my best to catch my little Bro, on the last corner I took my chances for a last bender, Dan went wide, Tom Harris snuck through and it was a close finish. Danny took the honours with Tom in second and me third. So, that kind of just leaves the fight for the silver roof! 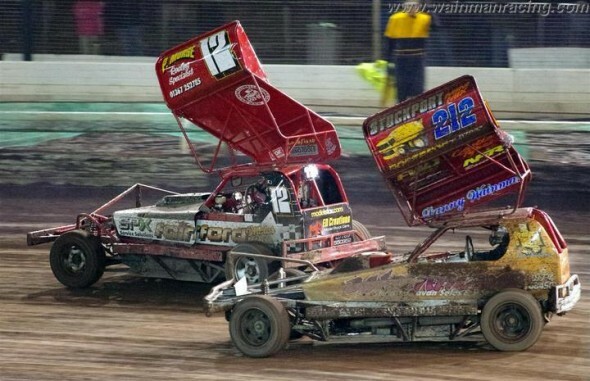 The Grand Finale at Belle Vue next Sunday will determine which driver will be wearing the Silver Roof throughout 2013. I’m in with a good chance, but I’m sure it’s not going to be easy for any of us! Fingers crossed for a bit of luck going my way! Just wanted to finish by thanking my brilliant team and family and fantastic fans for keeping me, Danny, JJ and Phoebe racing. It’s been a very difficult year for us, both time wise and financially. I have been very moved by the kindness and support of friends and fans alike, who are always there in good times and bad. Thanks everyone.